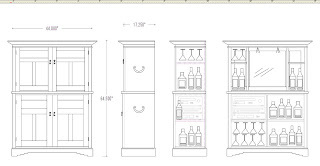 I've been working with a client on designs for a bar cabinet for The Walnut Paneled Room for a couple of months now. Nothing serious, no great urgency, typical back and forth ... sketch here, cad drawing there ... arm waving here and there, but now we think we're homing in on it. 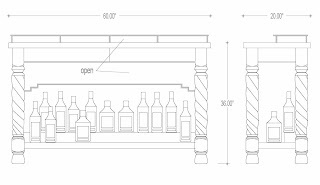 So, knowing the client was going to be here this weekend and having just had a really good experience with a full size mockup with another client I decided to make a cardboard model of the bar. I had to deliver some other stuff to the house last week anyway. It turned out ot be very helpful for all of us. I think it took about an hour and a half total effort, and, in the end, you could probably mix drink on it to try it out. Drawings are great, but the 'real' thing, real size, is usually better ... Click the pictures to enlarge them. 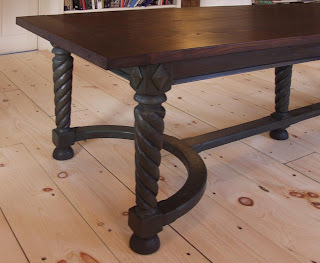 The table leg and paint/wood combination we're considering. 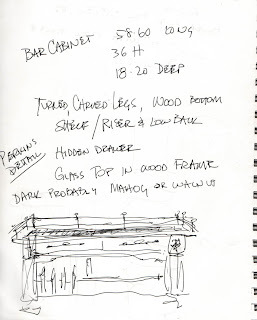 We're thinking about maybe a red for the carved legs and a lighter, more natural color chestnut or recycled oak for the top. You are so smart to do a mock-up. 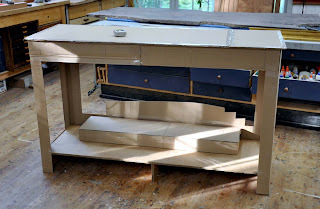 Sometimes the furniture looks great, but the scale when compared to the space it resides can be surprizing. 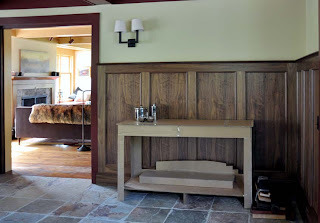 What I'm coming to like the most about this room is how everything seems to fit together, without every piece having the same tone or finish. 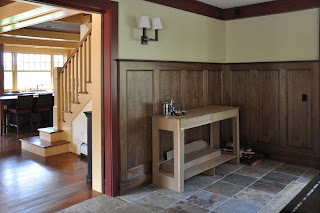 The paneling, the ceiling beams, the crown molding, the molding around the entrance are all unique, yet they fit together for the character of the room.